Kim Si-woo wins second place at 2018 RBC Heritage. April. 17, 2018 08:18. by Jong-Seok Kim kjs0123@donga.com. The bungling of the last putt cost Kim a chance to make history. In the 2018 RBC Heritage of the PGA Tour at Harbor Town Golf Links on Monday, Kim Si-woo tied the race with Satoshi Kodaira, a 29-year-old Japanese golfer, at 12 under. It was in the 17th hole that decided the fate of the two Asian golfers. Kodaira made his 7.5-meter birdie putt, while Kim missed his shot 6 meters away from the hole. Leading the game by two strokes at one point, Kim struggled with his putts in the late round, his inveterate weakness. 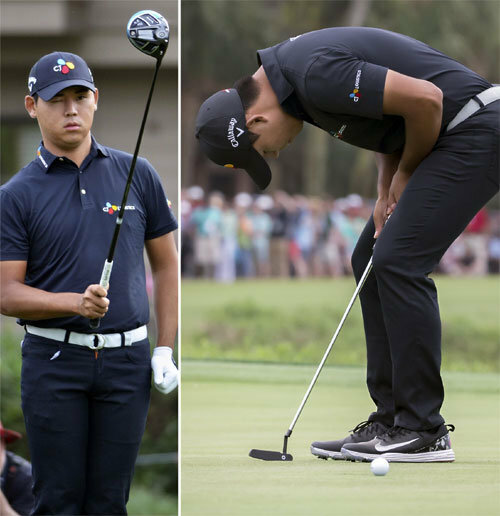 Kim lost his putts in four consecutive holes from the 15th to 18th, all of them within the distance of 2.5 meters. The number of putts, which stood at 13 in the first half, of the game, shot up to 18 afterwards. “I played defensively as I was in the lead. I tried to get them close to the holes instead of putting them in, which led to the mistakes,” Kim said after the game. On the PGA Tour of this season, Kim Si-woo’s putting success rate is 63.1 percent within the distance of 1.2 to 2.4 meters, which ranks him in the 173rd. To improve his precision, Kim hired Josh Gregory this year as his new coach, the former college coach of Patrick Reed, the champion of the Masters in 2018. Kim has jumped in prize ranking from 46th to 28th, thanks to the prize money worth 723,600 U.S. dollars. His world ranking has also soared from the 51st to 39th. Kodaira, who won his first PGA Tour championship at his sixth trial, has become the fifth Japanese golfer to have claimed a PGA Tour title. “It saw him using his 7 iron for a tee shot in the third playoff hole, so I took my 8 iron for my shot, which was a great help,” the Japanese golfer said in an interview.